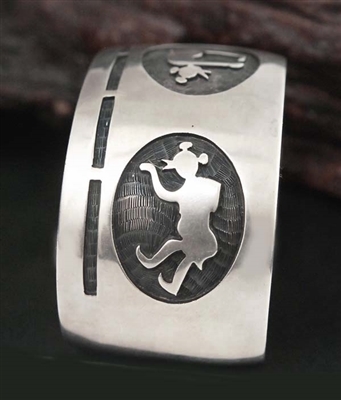 This striking sterling silver Hopi cuff bracelet is marked with the Hopicrafts shop hallmark HC, which was open from 1962 until 1983. A privately owned business by two Hopi brothers, Wayne and Emory Sekaqualtewa whom later move their business from Phoenix to Kykotsmovi. The jewelry produced at the shop was always well-made, with very close attention to the clean, fine detail of each piece. 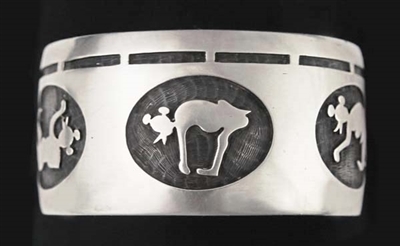 Competition brought on by the quality being produced at Hopicrafts shop helped improve quality of all Hopi jewelry being made during this period. 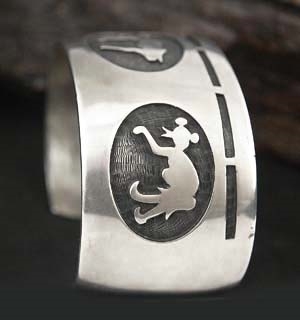 A soft matt finish and wonderful Mudhead figures, each in a different pose, makes this a very unique bracelet. It measures 1 1/4" wide. Inside measures 5 5/8" with a 1 1/8" opening. 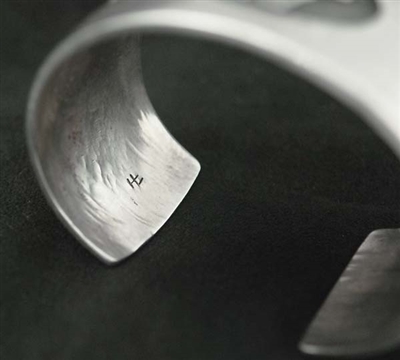 Hallmarked HL.